Large Format Up To 103"! With as many as 32 independent touches on the screen simultaneously (and this is increasing as the technology is developed further) many tasks can be performed at same time by many different users on the same computer. How easy is Multi Touch? Touchscreen products have become very much in mainstream use (Smart phones, tablets, convertible laptops etc..) have seen great success due to the real-world nature of the technology. Turning the page of an ebook, for example, is no different to turning the page on a paper-based book (you swipe a finger across the screen) which greatly decreases the learning curve and allows those less tech-savvy users to interact with the content. 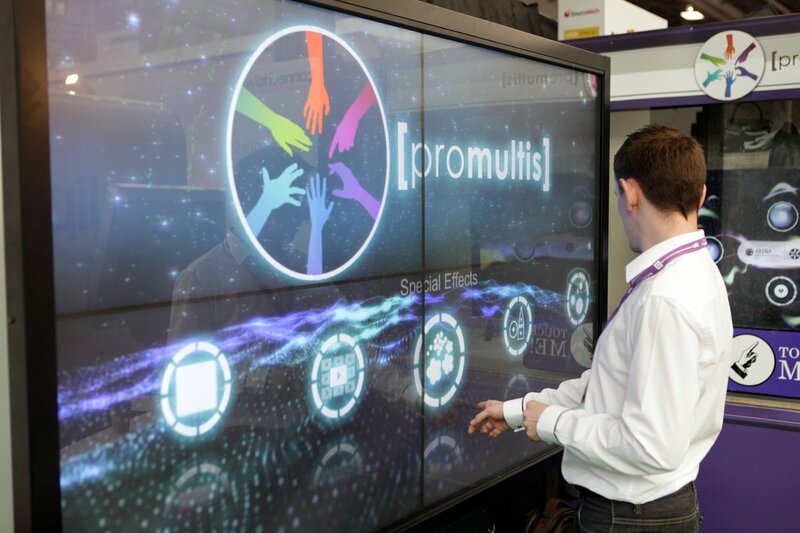 Who would benefit from Multitouch? The other key area for multi touch screens, table and walls is the museum and exhibition environment. Anywhere where customers, users or visitors need to interact or explore the information available to them, multi touch really becomes an essential tool as users want to “play” with what is shown in front of them. By enabling the user to explore in a non-linear fashion, you are empowering them to learn further.